A version 2 of the background document for the effort now underway at OASIS (see prior posts dated Nov. 1, 2013 and Jan. 15, 2014) provides a very useful bibliography on “neutral citation of court cases, statutes, and regulations.” It, in turn, has drawn comment from F. Tim Knight on Slaw. On May 17, 2010, the U.S. Supreme Court decided United States v. Comstock, holding that Congress had power under the Necessary and Proper Clause of the U.S. Constitution to authorize civil commitment of a mentally ill, sexually dangerous federal prisoner beyond his release date. (18 U.S.C. § 4248). Three and a half years later, the Court communicated the Comstock decision’s citation pagination with the shipment of the “preliminary print” of Part 1 of volume 560 of the United States Reports. That paperbound publication was logged into the Cornell Law Library on January 3 of this year. (According to the Court’s web site the final bound volume shouldn’t be expected for another year.) United States v. Comstock, appears in that volume at page 126, allowing the full case finally to be cited: United States v. Comstock, 560 U.S. 126 (2010) and specific portions of the majority, concurring and dissenting opinions to be cited by means of official page numbers. This lag between opinion release and attachment of official volume and page numbers along the slow march to a final bound volume has grown in recent years, most likely as a result of tighter budgets at the Court and the Government Printing Office. 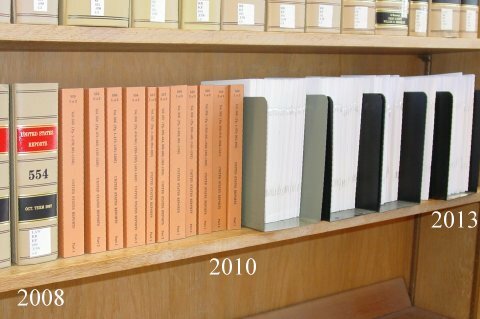 Less than two years separated the end of the Court’s term in 2001 and our library’s receipt of the bound volume containing its last decisions. By 2006, five years later, the gap had widened to a full three years. Volume 554 containing the last decisions from the term ending in 2008 didn’t arrive until July 9 of last year. That amounts to nearly five years of delay. If the printed volumes of the Court’s decisions served solely an archival function, this increasingly tardy path to print would warrant little concern or comment. But because the Court provides no means other than volume and page numbers to cite its decisions and their constituent parts, the increasing delays cast a widening ripple of costs on the federal judiciary, the services that distribute case law, and the many who need to cite it. The nature of those costs can be illustrated using the Comstock case itself. As released the Court’s slip opinions do not provide the information necessary to meet current citation norms. For the period they carry Supreme Court decisions lacking official volume and page numbers legal database providers must, therefore, decide whether to employ a proprietary citation scheme of their own and further which of the dominant, competing unofficial volume and page number systems (S. Ct., L. Ed. 2d) to insert as slip opinion identifying numbers and divisions. Since neither of the latter are instantly available, their use requires later editorial intervention. None of these alternatives is without costs. Indeed even the dissent acknowledges that Congress has the implied power to criminalize any conduct that might interfere with the exercise of an enumerated power, and also the additional power to imprison people who violate those (inferentially authorized) laws, and the additional power to provide for the safe and reasonable management of those prisons, and the additional power to regulate the prisoners’ behavior even after their release. See post, at 12-13, 17, n. 11. To be sure, protecting society from violent sexual offenders is certainly an important end. Sexual abuse is a despicable act with untold consequences for the victim personally and society generally. See, e.g., Kennedy v. Louisiana, 554 U. S. ___, ___, n.2, (2008) (ALITO, J., dissenting) (slip op., at 9, n. 2, 22–23). In short, because the Comstock decision, itself, and the Kennedy decision cited by Justice Thomas lacked permanent citation data in 2010, its text carried temporary and incomplete references that later had to be interpreted and filled in by the Court’s Reporter of Decisions (Frank D. Wagner through 2010, since 2011, Christine Luchok Fallon). That, however, is only the beginning of a cascade of revisions that must follow. As of today, less than a month after the availability of Comstock in preliminary print form, what have the major online services done with its updated content? Westlaw’s editors have inserted the official report page breaks in that service’s version of Comstock, but have failed to conform Justice Breyer’s cross reference. In Westlaw, as in the “Interim Edition” of the Supreme Court Reporter, his reference tracks the original, with the pagination converted to that in the company’s print reporter. It still points to “n. 11”. Justice Thomas’s citation to Kennedy v. Louisiana, has the jump cite pages in the official report blank, augmented by complete parallel references to the Supreme Court Reporter. Lexis has caught the change in the footnote referenced by Breyer and substituted the official report pagination for that used in the slip opinion, placing the cross-reference pagination of its Lawyers’ Edition reporter in parallel. It has also filled in the blanks in Thomas’s citation of Kennedy, placing Lawyers’ Edition pages in parallel but it has missed the additional page range appearing in his citation that was not signaled in the original by a blank (“468-469”). Bloomberg Law has inserted the official report page breaks but the cross reference remains exactly as it was in the slip opinion, complete with the now useless slip opinion pagination. The Thomas citation also stands exactly as it was, providing no page numbers in 554 U.S.
Loislaw has added the new official cite to the Comstock slip opinion, enabling retrieval by cite alone but has not added page breaks or conformed the text in other ways. Casemaker has not added the official cite so the case must be retrieved by name or by use of the Supreme Court Reporter cite. The case carries Supreme Court Reporter page breaks and is in other respects conformed to the Thomson Reuters edition. Fastcase holds the case in slip opinion form, with slip opinion pagination, but it can be retrieved using the Supreme Court Reporter cite. Google Scholar like Casemaker conforms to the Supreme Court Reporter and does not yet reflect the availability of the official version or its cite. This is only the beginning of the cascade, for during the three and a half years separating Comstock’s release and its acquiring an official cite the decision was cited (necessarily in some incomplete or unofficial fashion) by hundreds of lower courts. Shepards (Lexis) shows 191 entries on Comstock’s subsequent appellate history, 231 other citing decisions, and 441 citing references in law reviews and treatises. Legal database providers must decide which of these references to edit to include the Supreme Court’s decision’s official citation and how, if at all, to translate any pinpoint references into official pagination. How much simpler it would be for those of us who work with case law and less costly for the services on which we rely if the U.S. Supreme Court were to release its decisions in final and citable form rather than allowing a three to four year lag between release and the near final preliminary print. Illinois appellate decisions (as well as those of several other states) demonstrate the comparative advantages of such an approach. ¶ 15 We find support for our determination in our supreme court’s recent decision in People v. Cruz, 2013 IL 113399, 985 N.E.2d 1014, 369 Ill. Dec. 28. In Cruz, the defendant filed a petition seeking relief under the Act. The case proceeded to the second stage, and the State moved to dismiss, arguing, inter alia, untimeliness; the trial court granted the State’s dismissal motion. Id. ¶¶ 8, 15. The defendant appealed, and the State argued for the first time that the trial court’s dismissal should be affirmed because the defendant failed to attach a notarized affidavit to his pro se supplemental petition alleging a lack of culpable negligence. Id. ¶ 16. The appellate court agreed with the State, concluding that, “‘because [the defendant] filed no notarized affidavit to support the allegations of cause for the delayed filing, the trial court properly dismissed the postconviction petition.’ [Citation. ]” Id. 1. The dissent appears to assign pretextual motives to the Board’s economic layoff of tenured teachers. Infra ¶ 41 (Theis, J., dissenting, joined by Kilbride, C.J.). However, it is undisputed that the layoffs in this case were based on nonpretextual economic reasons. 2. The dissent acknowledges this statutory distinction (infra ¶ 45 (Theis, J. dissenting, joined by Kilbride, C.J. )), yet fails to recognize its legal significance in construing these statutes. Legal information providers can load Illinois decisions “as is”. When they later receive volume and page numbering in unofficial reports (notably N.E.2d of the Thomson Reuters National Reporter System) they can, but need not, merge the resulting case cites and page breaks into the official versions. At a time when few researchers rely on print reports, the Supreme Court’s continued dependence on a set of print volumes, produced long after the fact, for a case’s official cite (and final text) is a costly anachronism. The growing lag in production of those volumes cannot be excused by the existence of many electronic sources. Indeed, their number and importance in legal research increase the ultimate burden of the delay. Finally, there is an indeterminate hidden cost. So long as years separate initial slip opinions from their final official versions, justices face a troubling temptation to continue fiddling with their texts. One trusts that a desire to have a lengthy period for revision is not the cause of the recent increase in delay, but that delay does inevitably invite authorial “improvement”. The proposed OASIS Legal Citation Markup (LegalCiteM) Technical Committee reported in an earlier post has now been chartered and has issued a call for participation. The committee’s first meeting will be held on Feb. 12, via teleconference. What does the start of a new year mean in legal citation? A year change prompts reflection on the roles dates play in legal citation. I use the plural “roles” because of the diversity of functions dates serve in citations. With some sources they are largely superfluous; with others, they are critical to retrieval. As noted in a prior post, the full date of release is a crucial part of the identifying data for any unpublished opinion. Among the decisions released this week by the Second Circuit is one that should now and into the future be cited as: Wager v. Littell, No. 13-1683-cv (2d Cir. Jan. 6, 2014). In a majority of U.S. jurisdictions, however, the year of a precedential decision is not critical for identification or retrieval. Nonetheless, it is routinely included as one element of a complete case citation. Thus, when a 2013 decision of the U.S. Supreme Court cites an earlier decision, that decision is identified as Trainor v. Hernandez, 431 U. S. 434, 443 (1977). Why include the year? “431 U.S. 434” provides all the information one needs to retrieve that earlier decision from any database or library shelf? The reason presumably is that knowing the year of a decision may help a reader to decide whether to look at it. It provides useful but not critical information. Finally, it may be worth noting that the year incorporated within a decision citation is not the year that the case was compiled into a print volume or that the volume was finally published but rather the year the decision was issued. Citations to session laws generally include the year of enactment. Indeed, the year is often part of an act’s name. If the legislation has not been named, its full date will be employed for that purpose, as, for example, “Act of Dec. 9, 2013”. What to do when citing to a section of a jurisdiction’s codified laws is bit of a puzzle. Should a year be furnished and, if so, what year? Now that the year is 2014 has section 110 of title 17 of the United States Code become 17 U.S.C. § 110 (2014)? Is that a function of the cutoff date of the writer’s source? The most recent print version of 17 U.S.C. § 110 published by the Government Printing Office appears in a set denominated the 2012 edition. However, since that edition extends through the term of the 112th Congress it, in fact, includes laws passed and signed into law in the early days of 2013. The volume in which 17 U.S.C. § 110 appears was printed in 2013. Other volumes of the 2012 edition have yet to appear. Westlaw doesn’t provide an “as of” date for this or other sections of the U.S. Code but it does report that the most recent amendment of this particular section took effect on April 27, 2005. Lexis represents that its version of the U.S. Code is “Current through PL 113-57, approved 12/9/13.” The LII notes of its version “Current through Pub. L. 113-52” without providing a date. However one interprets of The Bluebook’s prescription on this point, it definitely calls for some date to be appended to 17 U.S.C. § 110, in parentheses. The more sensible approach, at least in legal writing produced by or for courts, is that followed by the U.S. Supreme Court. So long as an opinion of the Court is referring to sections of the code currently in effect, its citations include no date element. The lower federal courts follow the same practice as do most lawyers submitting briefs to federal courts. One also finds dateless statutory citations in the appellate decisions and briefs from such prominent states as California, Massachusetts, New York, Pennsylvania, and Texas. Only when the provision being cited has, by the time of writing, been repealed or amended or has only recently been enacted does it become important to specify the date of a compilation that contains the language being cited. The precise form this takes will necessarily be governed by the form in which that compilation presents its cutoff date, and it ought to report the compilation date not the year that compilation appeared in print or online. The considerations bearing on citations to regulations appear very much the same. However, professional practice is less consistent. Justices of the U.S. Supreme Court and judges of lower federal courts will often include the year of compilation for a Code of Federal Regulations provision in an opinion’s first citation to it, leaving the year off all subsequent references. Arguably, for as long as annual print compilations constituted the principal source for codified regulations that approach furnished useful information. Today, with constantly updated compilations maintained not only by commercial online services but the Government Printing Office, it makes better sense for both writer and reader to understand that a citation in a brief or opinion to 37 C.F.R. § 205.22 refers to the provision in effect at the time of writing. With a section that has not changed since 2008, the addition of 2013 or, as of last week, 2014 in parentheses serves little purpose. For that reason many judges and lawyers would cite to 37 C.F.R. § 205.22 (or a state equivalent) without indicating a year, again, unless the litigation concerned an earlier version or the regulation in question has undergone recent change. Dates are far less precise and therefore less useful in citations to journal articles. Because publication delays are common with student-edited journals, numerous articles that failed to appear in 2013 will nonetheless carry that date. Many destined to appear in 2014 last received attention from their author or an editor in 2013. Judicial opinions, legislative enactments, and regulations all carry specific release or effective dates. Individual journal articles do not. Notwithstanding the imprecision and limited utility, attachment of the nominal year of publication to article citations is accepted practice. The same holds for treatise citations with greater reason and despite a further difficulty. Most major treatises have been acquired by an online research service and are bundled with the service’s primary law materials. In both print and online form they are updated at least annually. In print, the updates may be integrated, the case with treatises published in a looseleaf format, or they may be issued in a separate supplement. Online, they are integrated without any indication of what was changed or when. Under these circumstances, how should one date a section of A. Wright, A. Miller & M. K. Kane, Federal Practice and Procedure or M. Nimmer & D. Nimmer, Nimmer on Copyright in a brief or opinion prepared during 2014? Should that depend on whether one accessed the material in print or online? Assuming that one is citing to the current work rather than a prior edition or version, the best practice is to cite to the year of the most recent update or revision of the source relied on. Following that practice one would in January 2014 still use the year 2013 for both those works since they were last updated during that year, a fact noted in their print and electronic versions. The updating phenomenon bestows greater importance on the date associated with a treatise citation. Unlike journal articles these are not static works. A reference to a particular section as it existed some years ago, 2004 say, or 1994, may well, if followed into the current version of the treatise, take the reader to significantly different text . The year accompanying the citation provides a reminder of that reality even though it may be difficult verging on impossible for those working in a contemporary research environment to determine exactly how the cited section read in 1994 or 2014. Neither Lexis (Nimmer & Nimmer) nor Westlaw (Wright & Miller) archive past versions of their treatises online as they do past statutory codifications. The issue to be considered here is how to cite such unpublished, non-precedential decisions. Both the September and December opinions are available on the Eleventh Circuit Web site. They and other Eleventh Circuit opinions applying the same sentence enhancement provision of the ACCA can be found with a Google web search (site:www.ca11.uscourts.gov “Armed Career Criminal Act” “residual clause”) or through a search on Google Scholar limited to the Eleventh Circuit. Anyone finding the court’s decision in United States v. Hayes on the open Web would, however, be unaware that, notwithstanding, the “DO NOT PUBLISH” label the editors of Thomson Reuters selected the decision for publication in a set of books that no law library I’ve ever used has seen fit to buy or shelve, the Federal Appendix of the National Reporter System. (The Federal Appendix is for sale. The full set, currently 523 volumes, covering a mere dozen years, can be yours for only $7,093.80, just marked down from $10,134, perhaps for the holidays. However, the print market was never that publication’s aim.) Within that series the Hayes decision is reportedly located in volume 409, at page 277. That information is not available on the open Web. Furthermore, unless a person finding and wanting to cite Hayes is a subscriber to Bloomberg Law, Lexis, or Westlaw, she would not be aware that those services have designated it, 2010 BL 299236, 2010 U.S. App. LEXIS 25741, and 2010 WL 5122587, respectively. Those high end services also provide the case’s Federal Appendix cite, 409 Fed. Appx. 277 (or as converted by The Bluebook, 409 F. App’x 277). Persons with access to Casemaker or Fastcase could discover and retrieve the Hayes decision using a suitable query, but neither of those services adds their own proprietary citation or reports the citations added by their competitors. Until the federal courts begin attaching neutral citations to their own decisions, the only effective way to cite Hayes or any other “unpublished” but widely distributed decision is to include both the docket number and the full date of the decision, as in “United States v. Hayes, No. 09-12024 (11th Cir. Dec. 16, 2010).” The docket number, coupled with deciding court, enables retrieval of the opinion from all competing commercial research services, from Google Scholar and the open Web. The full date, particularly important with this example, allows anyone following the citation to realize that the vacated September 8 opinion, which the docket number will also retrieve, is not the target of the reference. In sum, both The Bluebook and the ALWD Citation Manual have been led astray. An unpublished decision should be cited as an unpublished decision. Docket number, court, and full date work effectively to identify and retrieve a cited case across sources, including importantly the open Web. A citation to the Thomson Reuters Federal Appendix is no substitute. Nor is a citation using the proprietary numbering system of one of the commercial online services. Of course, there is no harm, beyond the space consumed, in adding a Federal Appendix, Bloomberg Law, Lexis, or Westlaw cite to that essential core. On the other hand, unless one is confident that all important readers of a document will have access to a system on which such a proprietary cite will work, the added value is not likely to be worth the increase in citation length. Under the influence of those appearing before them and the guidance of their clerks, federal judges need to bring their citation practice into accord with the concern over access expressed in the Eleventh Circuit rule.